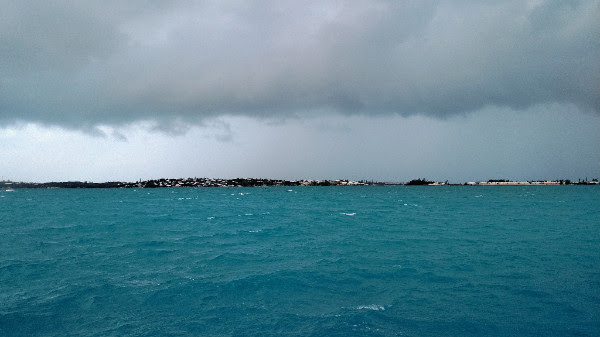 The first day of the Bacardi Moth World Championship in Bermuda was postponed today [March 26] due to gale force winds. James has also issued an amendment to the sailing instructions that allow him to run up to four races per day. The postponement affords competitors an extra day of tinkering with their boat and equipment. Mothists are renowned for constantly modifying their equipment and the world championship is the time to put those developments on display. Ebullient Frenchman Benoit Marie, a naval engineer by trade, has designed and built a new boom in conjunction with European aeronautical giant Airbus. The boom attempts to make better use of the deck sweeper mainsail that is becoming common in the class. Class rules place maximums on sail area and luff length and the deck sweeper places more sail down low off the luff, between the gooseneck and boom vang. The fleet features mainsails from KA, Lennon and North. The designs are trending on the flatter side to increase upwind performance but might come at a cost downwind. Jensen’s boom also has a plate on top of the outboard end to help clean up the end plate effect, similar [on a much smaller scale] to what the America’s Cup catamarans were attempting. Jensen said that the lack of grunt might be due to the lower rig height that’s necessary to accommodate the deck sweeper main. Jensen, Paul Goodison of the U.K. and American Brad Funk are using the higher angle wing racks in an attempt to gain righting moment to increase straight line speed. “I got the higher angle bars about the same time as the deck sweeper and noticed a big increase in righting moment,” said Jensen. Underwater, Matt Struble of the U.S. has been designing and building new foils in the holy grail chase of more lift and less drag. Struble, who won the U.S. Nationals three weeks ago in Florida, has been working with a retired aeronautical engineer in San Diego, estimates he has designed and built nine sets of foils.